If you have property on Mallorca with outdoor space – a large expanse of (largely unusable) land like ours, a regular garden, or just a balcony or terrace – you’re going to need a means of seeking shelter from the sun. We love the sunshine, but it’s too darned hot (and risky) to sit in its glare for long. Initially we used this small covered terrace as an al fresco dining area, but we had several other terraces at our disposal and relocated our dining area to a larger space. Fortunately the previous owners of our finca – who have become very dear friends and own an apartment in Palma – had left us a few old parasols to provide shade in these open areas. Hombre, have we had some fun with these things. An early incident involved a rat that had climbed up to shelter inside a closed parasol (which we’d foolishly left outside for some time without a cover on it). Unsuspecting, The Boss opened said parasol, only for the rat to jump out, using his shoulder as a stepping stone to freedom. I still shudder thinking about it. Is it any wonder that The Boss warmly welcomed the various cats that have made our finca their home? Lots of cats = no rats. We subsequently bought new parasols of what we believed were a better quality. They were certainly heavier to manoeuvre when we wanted to move them to maintain shade as the sun made its way across the sky; not too heavy to cope with a very strong wind though. On one occasion, an open parasol at the front of the house suddenly took off (à la Mary Poppins but without the attached saccharine-sweet woman), hit the roof as it blew right over our single-storey property, and landed in a crumpled heap behind the house. 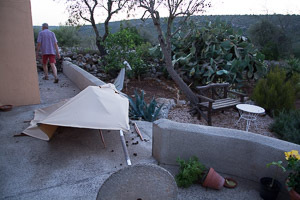 Another time, we came home from an outing with friends to find that a mini-tornado had cut a swathe through our property, uprooting furniture and, you guessed it, destroying another parasol.